When I left my long-time corporate leadership role to launch my own business, our team gave me a lovely set of candles, each with an inspirational word on it. I keep these in my office, rotating different ones to the front when I need its message most. So, on stressful days, “peace” is there to greet me; on stretch days, “success” might rotate to the front. Lately, I keep moving “luck” ahead of the rest. The right people keep calling. Interesting words keep finding their way from my head to my mouth. Opportunities pop up from surprise places. “How’d ya get so lucky?” colleagues ask. The old answer was “hard work,” which is still true, but I’m finding that that’s not enough. 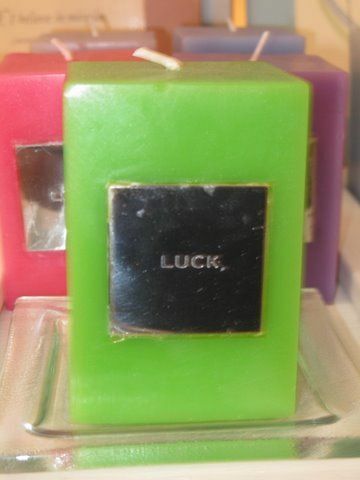 So, candle magic aside, here are my five secrets for creating workluck that can work for you, too. How often have you heard someone in your office, when faced with a detailed explanation, say “hey, dude, TMI (too much information)–I don’t wanna know.” But the reality is that knowing more–just a little more–can open up the lucky strikes you’re looking for. What’s the real truth why this is a problem for us? What’s getting in our way of making any changes? What assumptions are we making about this issue? Are they all really true? Getting crazy curious opens up the new lanes of luck you haven’t traveled down yet–and who knows where they’ll take you? Can the workluck fairies find you? Or is your door closed, your head down in your Blackberry, your headphones on in the airport? When I looked at the luck popping up, I realized it didn’t grow out of the piles on my desk. It came when I worked heads-up, looking at people, building relationships, making connections. Offering a greeting, sharing an idea or starting a conversation has created lots o’luck for me without a lot of o’effort. Discover the next three secrets here. . .